Only owners of private houses could allow having a fireplace anteriorly. Nowadays, everyone can add it to the interior of any apartment. Modern technology allows you to put electric fireplaces in any room, and you can create a false pattern by your own hands. Decorative fireplace is a great way to create a cozy and relaxing atmosphere in the interior of a house or apartment, the possibility of introducing exclusivity and originality. It will save you such troubles as building a chimney, coordination and obtaining permits in various state organizations, risk to the household and neighbors. 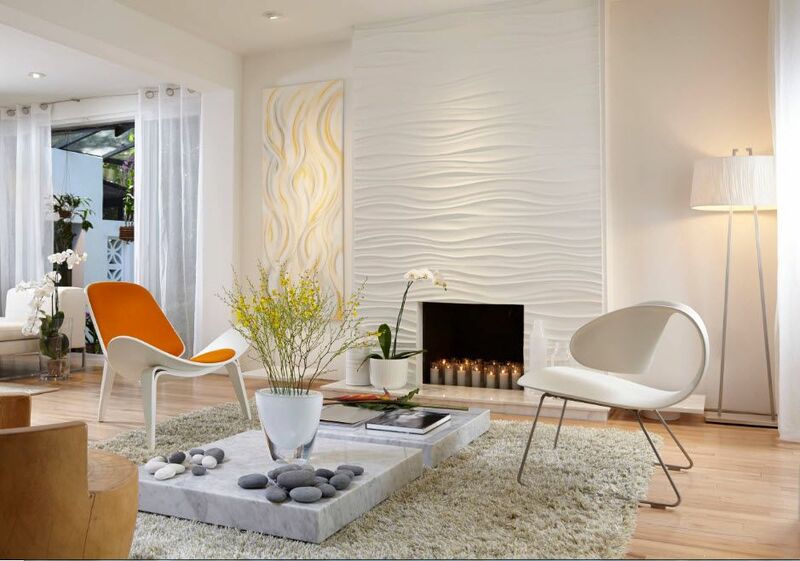 The modern market offers many models of decorative fireplaces. It’s really a hard work to choose one. Electric fireplaces usable as heaters are the most popular. The flame in such equipment is the image on the screen. Modern models are equipped with the functions of creating a rather realistic picture. Obviously, such devices don’t require making a chimney or some reconstruction of the room. It is enough to have an electrical outlet. Many owners of apartments and houses argue that the flame in electric fireplaces is not natural and they prefer to install gas fires. The flame in such furnaces will be natural, but it takes some to receive permission in governmental organization for putting such heater. And the place for its installation is very limited – the device will need a connection to the gas pipeline. An effective alternative to the gas focus is the portable model of the so-called bio fireplace. The device can be installed in any location without binding any communications. It does not require the creation of hoods and it’s safe from the point of view of operation. In addition, in the bio-fireplace you can admire the real flame. The source of fire is a special type of fuel, which is based on alcohol. But all the models of simulating a fireplace in the interior have a serious drawback: a fairly high cost. Designers offer us a very elegant solution of this situation: a real fireplace, but it will be without the possibility of creating a flame. Of course, there is no need to expect physical heat from such the construction, but it’s expropriate way to create some warm atmosphere in the interior. False fireplace can be created by own hands, setting it even in the children’s room without risk and special troubles. In addition to the fact that a decorative fireplace can be used in an apartment or any room, it has other advantages. Behind the false fireplace you can “hide” the unsuccessful architectural solutions (ledges, pipes and beams, joints of tiles, etc.). Also inside the electrical fireplace can be hidden various communications – the electrical wires for the camera or player, backlight. False fireplace is cheap and safe, you can show your design skills by creating it yourself. Undoubtedly, such an element of the interior will become its decoration, having adjoined the rest of the decor of the room. A mantelpiece can be used as a storage system. even drawing and stickers for the walls. Stationary (the hearth is in one place permanently and it can’t be transferred). Mobile electrical fireplace is often a design that looks like a closet, but with a façade in the shape of a fireplace portal. It has some advantages: decorating of the room; can be moved, taken with you to other apartment; used as a storage system; putting books or photos on the fireplace; hiding inside the construction some necessary things. Stationary electrical fireplace in the interior isn’t only a decorative element, it can perform several functions. Everything depends on the purpose of the room , the shape of the fireplace portal, the material and style of interior decoration. Certainly, it’s better to plan the creation of a fireplace before repair. But this doesn’t mean that it is impossible to integrate an electrical fireplace into the already designed premises. However, you should be more careful installing it in the renovated room not to destroy something. Frame made of wooden beams covered with plasterboard or plywood is more often used for the creation of a fireplace. The design turns out to be sufficiently reliable both for use in the original form, and as a portal in which an electric fireplace will be installed. 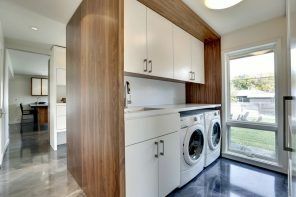 Creating a frame for the subsequent installation of an electrical appliance, it is necessary to use refractory drywall. And as a profile for mounting drywall it is better to use metal products. False electrical fireplace will look good with such unusual exquisite flowers like orchids. Created from wooden frame, trimmed with plasterboard, mantelpiece turns out fairly solid. It is fully capable of withstanding the weight of frames from photos, books and even vases with flowers. Also you can place on it quite heavy metal objects in medieval style, if the room’s interior is in harmony with them. Nothing contributes to the creation of a symmetrical layout of the living room, like a fireplace installed in the center of one of the walls. 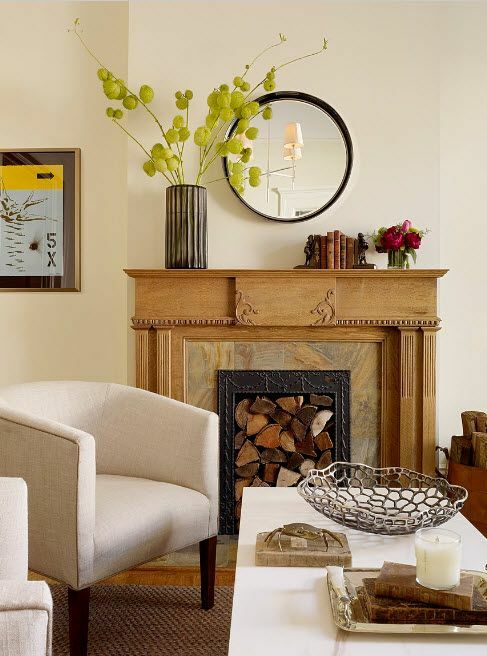 The hearth immediately becomes the focal point. Furnishings and decorations are arranged around it: a sofa and armchairs, a coffee table and various stands. The space above the fireplace becomes an example of symmetry – a TV or a mirror, a picture or a panel above the mantelpiece and candlesticks, lamps or books on it. So, what will be filled to the space created by the fireplace, if we consider that the fire was not originally planned in it? There are a lot of different variants: bookshelves and a collection of unique minerals, original candles and aroma lamps, a flower vase or a herbarium created by one’s own hands. It can be a whole composition or one thing – a unique decorative element. One of the most common ways to fill a fireplace aperture is the use of logs. It creates a feeling that a real fireplace is in the room and it is about to be lit. This atmosphere will transfer you to a country house and bring you natural warmth. Even the logs lying next to the fireplace can create a special atmosphere. In addition, as an original decorative element, you can use a woodpile – it can be a basket, a metal stand or any other object created or chosen by you to attract everyone’s attention. Another, no less popular way to fill the space of the fireplace aperture is the use of varied modification of candles. Some combination of candles with different shapes and sizes will look sumptuous without light. Vases with live or dried flowers, compositions with branches, twigs and other gifts of nature, creating a special interior color, are very popular. Fireplace creates a very special atmosphere of relaxation and rest for preparation for sleep in the bedroom. And let the flame in the hearth is only the image displayed on the screen. But the hearth is completely safe for hosts and premises. You shoudn’t be afraid to fall asleep with the device on – almost all modern models have a “sleep mode” or they are able to simply maintain the room temperature set on the thermostat. Perhaps the only safe way from any point of view to introduce such an element of the interior as a fireplace into the setting of the children’s room is to create a false electrical fireplace. For a child or teenager’s room the fireplace aperture can be pasted with a magnetic black membrane on which a kid can draw and fasten details, set shelves for storing books or toys, some other important for the child. Compact or large-scale, stationary or portable, electric fireplace or just its imitation – this piece of furniture will in any case create an atmosphere of warmth and comfort in the room for holding meals. It is noteworthy that it is possible to create a hotbed in the dining room for any stylistic direction adopted for its arrangement: from classics to the avant-garde, from country to minimalism.